Could Samsung's next display push beyond 440ppi? With a pixel density of 326ppi, Apple's 4-inch iPhone 5 is home to one of the more, though by no means most pixelated, high-res screens on the market, but Samsung is reportedly working to one-up Cupertino and a number of others with its next generation of smartphones. The sometimes-reliable DigiTimes reported Tuesday that Samsung Display is working on "new pixel layouts" for small-size AMOLED panels intended for its upcoming handsets. According to unnamed industry sources, the technology implements "hexagon and diamond-shaped pixel layouts" to push pixel density above 440ppi, a significant boost over rival Apple. The report noted that the side-by-side layout currently in use for AMOLED display panels makes it "difficult to achieve" 440ppi or higher, which is why Samsung had to attack the problem a different way. Highest pixels in the Galaxy? 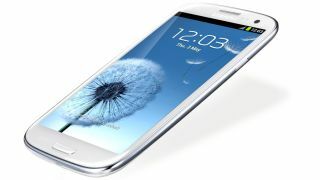 While the current Samsung Galaxy S3 features a Super AMOLED display with a pixel density of 306ppi, DigiTimes sources are already referring to the next-generation panel as "one of the highest resolution displays" available. Sources claim Samsung will use a laser-based LITI production method to manufacture the higher-resolution display panel, which might make its debut in the upcoming Galaxy S4 handset. While Apple claims to have the best screen out there, rivals like HTC's Droid DNA already house displays marked at 440ppi. If Samsung pushes its screens above 440ppi, it will set the stage for a pixel war of epic proportions. As noted, DigiTimes can be hit or miss, but with manufacturers continually squeezing more pixels into every inch in an attempt to claim the title of "most advanced" on the market, we wouldn't be surprised if this rumor bears some high-res fruit.